Michigan medical marijuana regulators are trying to chop the state’s current industry in half, two months ahead of the transition to a new, tighter regulatory system. The market contraction is a boon to dispensaries that remain in business – they stand to see a boost in sales – but it has sparked legal challenges by some of the businesses whose applications have been denied. Even the facilities that remain in operation have only temporary licenses: They need state regulators to approve their permanent licenses by June 15, when the new framework is scheduled to be in place. Some worry the process is going too slowly, that the market won’t be firmed up by the mid-June deadline and that Michigan’s 277,000 registered MMJ patients will be left with inadequate access to supplies. “That would be a complete disaster,” said Michael Stein, a Bloomfield Hills attorney who represents more than a dozen medical marijuana businesses, many of which were denied temporary licenses by local authorities. Existing medical marijuana businesses had until Feb. 15 to apply to the state for a license under the new regulatory regime. Failed to apply in time. Applied without conditional approval from their local authorities. That has left only 215 businesses with approval to continue operating while the state considers their applications. Detroit has been the hardest hit: 158 businesses in the state’s largest city were ordered shut by state authorities, leaving less than 70 in operation. State regulators had expected to start issuing new licenses this month for growers, processors, dispensaries, distributors and testing facilities. But no licenses have been issued yet. According to the state’s emergency MMJ rules, facilities would have to shut down June 15 if they didn’t receive their state license by then. The current restructuring stems from a 2016 law aimed at tightening regulations and addressing past legal confusions. Experts have been predicting for some time that the transition could be painful. It’s unclear to what extent the state has tried to enforce the cease-and-desist letters. But there’s been a pronounced shift in the market since the letters were issued. Michael Mayes – a cannabis consultant and chief executive of Greenwave Naturals, which operates a dispensary in Lansing – said the dispensary’s business has about doubled since the cease-and-desist letters were issued. “We are seeing two to three times the patients each day,” he said. Mayes especially worries if the state doesn’t license enough facilities to procure supplies by June 15. “That’s our larger concern – that there will be a shortage of medicine,” Mayes said. He said Greenwave is trying to stock up on supplies in anticipation of possible problems in June. David Harns, a spokesman for the Michigan Department of Licensing and Regulatory Affairs, said the state is working diligently to consider applications but that the process includes thorough background checks and facility assessments. “We’re doing our best to get as many applications through the process as we can,” Harns added. He noted that Michigan’s MMJ regulators have the discretion to take up and approve applications that have been initially denied. Stein, the attorney, said he has been able to keep at least eight of his clients’ businesses open temporarily while challenging local denials in court. In late March, Stein said, he won his first case when a circuit court judge ruled that the Detroit Board of Zoning Appeals had abused its discretion in rejecting the application of All Natural Collective, which has been operating in Detroit since 2014. A Wayne County circuit judge ruled that the zoning panel in part relied too heavily on anonymous complaints that the business, which operates within 1,000 feet of two churches, is a nuisance and blight to the area. Stein said he has received several calls from businesses that received cease-and-desist letters. The businesses complained that local authorities had failed to act on their applications in time for them to meet the state’s Feb. 15 deadline for submitting applications. “That’s a shame, because those businesses had every right to operate while their application was making it through the Detroit system,” Stein said. 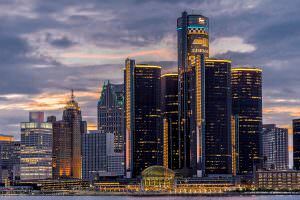 Detroit’s corporation counsel, Lawrence Garcia, wrote in an email to Marijuana Business Daily that it “is false” to say that the city has been dragging its feet. Garcia said the city has approved 70 locations for conditional use as medical marijuana dispensaries. Of those, 57 business owners filed the necessary paperwork with the state to obtain temporary licenses. Another 11 businesses, including many of Stein’s clients, received stays from enforcement while they challenge their local denials in court. The Detroit City Council also is considering new local rules, but that process should be completed in plenty of time for dispensaries with temporary licenses to win full approvals, Garcia said. According to Garcia, the city envisions about six dozen licensed dispensaries spread throughout Detroit when the process is completed. He said that will be an adequate number to serve the market. “According to the White Pages,” he said, “we have 36 CVS (drug stores), 33 Rite Aids, seven Walgreens, 32 McDonald’s, 22 Burger Kings and 10 Starbucks in the city of Detroit, and people don’t seem to have any trouble accessing nonmarijuana medications, hamburgers or high-end coffee. Even if there’s no interruption in MMJ dispensary services in June, Stein and Mayes said, the current climate has been disruptive because it has forced many medical marijuana patients to seek out other dispensaries and form new relationships. “The market was big enough to support a couple hundred Detroit dispensaries,” Stein said, adding that he hasn’t run into a shop that complained of a lack of business or supply. Chaos by gov is everywhere. Here in CA it is so complicated that the news said only 1% are bothering to get compliant. Maybe by design so govs can throw up their hands and say lets just let existing booze and tobacco licensees take over as the tax structure is already in place. Too much money to let the little guys get a piece of the action. Duh.